Christian Orientalist and theologian; born Dec. 10, 1768, at. Hesselberg; died at Leipsic Sept. 17, 1835. He studied at Erlangen, Giessen, and Leipsic under his father, and became assistant professor of Arabic at the university of the last-named city in 1796. He devoted a large part of his life to his "Scholia in Vetus Testamentum," in twenty-four parts (Leipsic, 1788-1835), which formed the basis of most of the exegetical work on the Old Testament in the nineteenth century. He published in five parts an abridgment of this colossal collection (ib. 1835). Besides this his "Bibliographisches Handbuch," in four parts (Göttingen, 1800), was one of the earliest introductions to the Old Testament; and his "Handbuch der Biblischen Alterthumskunde" (Leipsic, 1831) was a systematic summary of the material contained in his "Scholia." Further, he published editions of Bochart's "Hierozoicon" (1796). 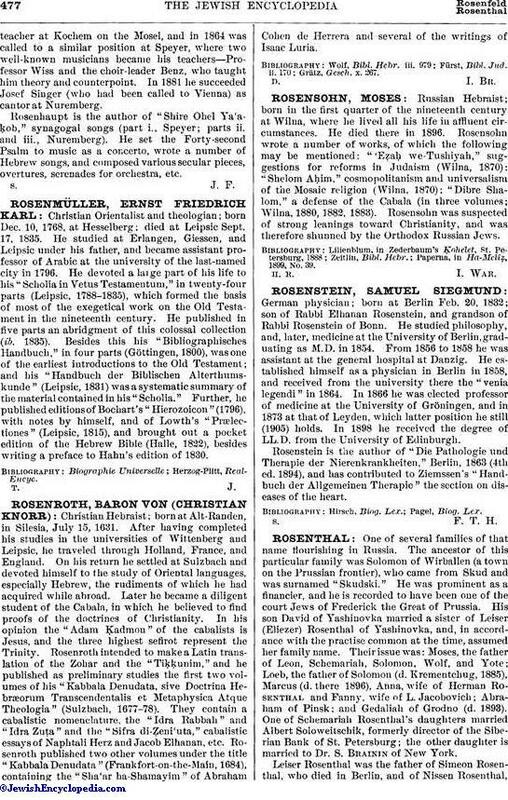 with notes by himself, and of Lowth's "Prælectiones" (Leipsic, 1815), and brought out a pocket edition of the Hebrew Bible (Halle, 1822), besides writing a preface to Hahn's edition of 1830.